With all the crossover SUVs on the market, it can be overwhelming finding one that meets your needs, but we can help at Patriot Hyundai. The Hyundai Santa Fe is a popular crossover SUV because it comes with features that enhance protection. Read more to check out a few of its safety features. With the Santa Fe, you get Rear Cross-Traffic Collision-Avoidance as a standard safety feature. This feature relies on the radar sensors from the Blind Spot Detection System to monitor for vehicles that are approaching from the side when the SUV is in reverse. If the system detects a vehicle, it will send you an alert and can engage the automatic brakes to help you stay clear of impact. 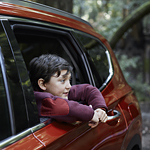 Rear Occupant Alert is an available safety feature that comes with the Santa Fe. With this feature, an ultrasonic sensor will monitor for occupants in the back seat. You will be sent a reminder to check for children and pets before you leave the Santa Fe. In the event that the system detects motion in the rear seats after you have left the vehicle, it will sound the car horn and send you an alert to your smartphone.